adding fuel as the clutch pulls down the the engine rpm. 85 GPM with some just over 100 GPM. Dave Settles (gerotor pump ) generally referred to as the ‘Nuke’. Today all Fuel cars use a Pete Jackson ‘Metering Valve’ J.T. Stewart, in Phoenix. The duplex metering valve replaced the two barrel valve system most teams were using. The need for two barrel valves was due to the fact the old Enderle style barrel valves were too small to flow the volume from two pumps being overdriven. Pete Jackson continued to improve the metering valve for years by moving and adding idle return ports over the years ( there is several slight variations). Today the Metering Valve is largely unchanged and it comes from J.T. 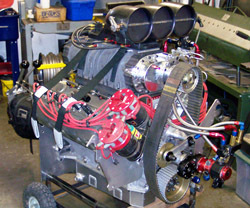 Stewart in a -10 or a -12 inlet size. SLIDE VALVE - The Slide Valve is responsible for the fuel curve and the rate of enrichment. AFT Slide Valve: The AFT was the first Slide Valve. A piston that has a slot or opening to allow fuel to pass through at idle slowly closes over time based on applying air pressure to the sealed area on top of the piston. 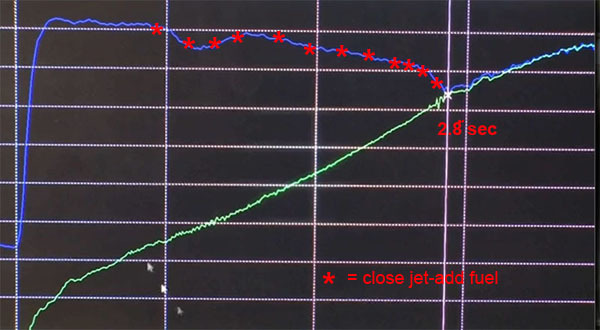 There is a speed control to allow the piston to move slowly at first then faster toward the end of the travel to accommodate the rate of enrichment requirement. A timer starts the movement of the piston and another timer to speed the piston when desired. Pete Jackson Slide Valve: A fuel control device that works off fuel pressure rather than adding more timers and having to control the speed of the Slide Valve. It is a marvelous invention with only 1 moving part. Today they are manufactured by Alan Johnson. The Pete Jackson Slide Valve works by supplying fuel pressure to a chamber with a 2.5 in. piston connected to a .750 diameter stem with a notch cut to bypass fuel at idle. When you hit the throttle the fuel that is supplied to the chamber is shut off and the pump pressure pushes the piston that pulls the stem slowly past the inlet hole to close the fuel bypass off over time. The chamber that was full of fuel at idle is passed through what is called the time jet. The bigger the jet size the faster the Slide Valve moves and conversely slower with a smaller jet. The stem of the Slide Valve is where the magic is. You actual cut a curve in the stem to create the fuel curve. Each stem is cut for the pump size, total nozzle area and system pressure. There are a few more ways to tailor the way it works with inlet size, and the depth of the notch in the stem. by Don Jackson Engineering.It works like a big poppet valve. The pressure is set with an externally adjustable spring. CO2 is added to the top of the poppet to prevent the regulator from opening before it's intended time. The BDK can regulate 15 to 20 GPM at 500 to 700 psi. Most teams open the BDK around 3 seconds into the run. The BDK eliminates any need for other top end lean-out devices ( lube it occasionally ). 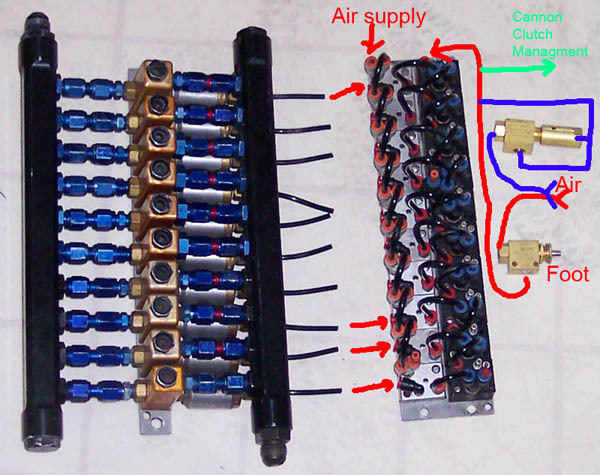 AJ VALVE - The AJ valve is a clever device to increase the throttle response of the fuel system. When it’s in the closed position all the fuel goes in to the engine or through the idle bypass circuit. 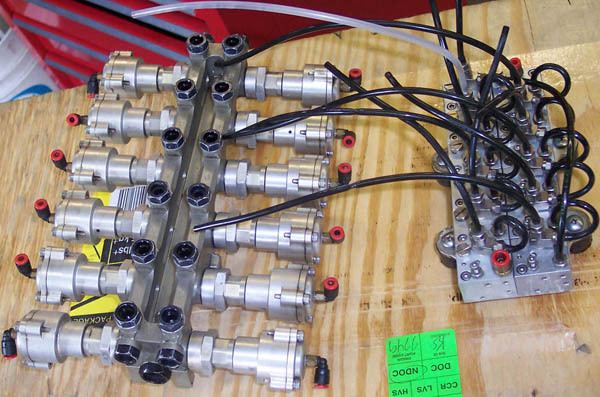 (Idle check valves) This device has several counterparts made by a few different guys, J.T. Stewart makes one operating on a pendulum valve principal. Bill Miller uses a giant check valve. But most teams use an AJ valve made by Alan Johnson. It looks and works very similar to a BDK valve. 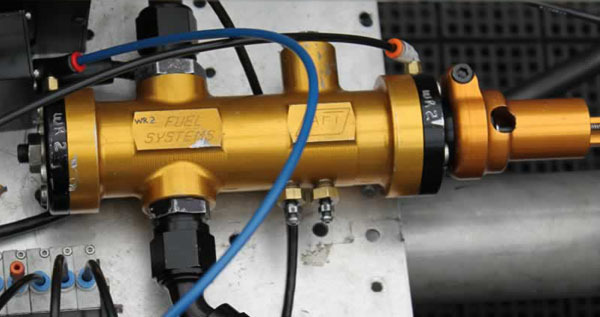 A small -3 fuel line is run from the pump to the bottom of the piston (poppet) to crack open the valve from its closed position allowing fuel to then move unrestricted through the fuel management. The pressure is set with an externally adjustable spring (like the BDK) the more pressure it takes to open the AJ valve the more fuel goes into the engine at the crack of the throttle. The reason you would need one of these devices is due to the fact that 45% to 55% of the pumps output is returned to the tank when you hit the throttle. For example to keep the math simple; say you have a 100 GPM pump and you want 55 GPM going into the engine at the step of the throttle. You would be sending almost ½ of the fuel back to the tank. That makes for a fairly lazy throttle response. Can you hear the driver complaining that when they hit the throttle nothing happens? Well unfortunately that is somewhat true. There are a few ways to make the response better by running very high idle check pressures or running the engine at very high idle flow. Mounted on the discharge of the slide valve this normally closed valve restricts return flow at the step increasing primary fuel flow until the valve is energized. Available in -10 line size , air operated see description for use above.